Lynne Tillman is a novelist, short-story writer, and critic. She is the author of five novels, four collections of short stories, two collections of essays, and two books of nonfiction. Her most recent novel, American Genius, a Comedy, was published by Soft Skull Press in 2006 and her second essay collection, What Would Lynne Tillman Do?, was published by Red Lemonade Press in 2014. Tillman’s writing has been widely anthologized and appeared in journals and magazines such as Tin House, Gigantic, Electric Literature, Black Clock, Bomb, and Conjunctions; her criticism has appeared in Artforum, Aperture, Nest, the Guardian, Art in America, and the Times Book Review. She writes a bimonthly column for Frieze magazine. Tillman was the fiction editor of Fence from 2004–2012. Currently, she is a contributing editor of Bomb and serves on the boards of Fence and Housing Works. She teaches in the Riggio Honors Program at the New School and in the School of Visual Art’s MFA program in Art Criticism and Writing. Abha Dawesar is a novelist and artist, the author of Family Values, That Summer in Paris and Babyji. John L. Bryant is professor of English at Hofstra University. His most recent book is Melville Unfolding: Sexuality, Politics, and the Versions of Typee. He is the editor of the Modern Library's edition of Melville’s Tales, Poems, and Other Writings and, since 1990, Leviathan: A Journal of Melville Studies. Alice Boone is a PhD candidate in English and comparative literature at Columbia University, specializing in the eighteenth century. Graham Parker is an artist and the author of Fair Use (notes from spam). Group Theory , a Brooklyn-based theater company, is Ben Vershbow and Dorit Avganim plus collaborators. Vershbow works at the New York Public Library running NYPL Labs, a digital skunkworks, devising ways to liberate archives and library data online. Avganim is an independent producer, working with artists such as Rainpan43, David/Ain Gordon, Tina Satter/Half Straddle, and the Debate Society, and is cofounder of Neighborhood Productions. April 23, 2010 8:00 p.m. Performance at 8 p.m. each night, followed by discussion at 10 p.m.
RSVP is required. Please email bartleby@canopycanopycanopy.com to reserve seats and receive ticket-purchase information. New York-based theater collective Group Theory probes the psychosonic landscapes of Herman Melville's classic novella Bartleby, the Scrivener in an intimate chamber ritual that transforms the private act of reading into a communal encounter. A strange literary-theatrical hybrid, this Bartleby is a performed palimpsest of rereadings, a hyper-lucid window onto a famously difficult text in all its haunting ambiguity and violent comedy. Followed by drinks and conversation with invited respondents, including Paul Chan, Edwin Frank, Lynne Tillman, Abha Dawesar, John Bryant, Vivian Gornick, Joseph McElroy, Alice Boone, Graham Parker, Molly Springfield, McKenzie Wark, and Greg Wayne. A special, print-on-demand edition of Bartleby, the Scrivener, designed by Rebecca Gimenez , is available from Lulu. 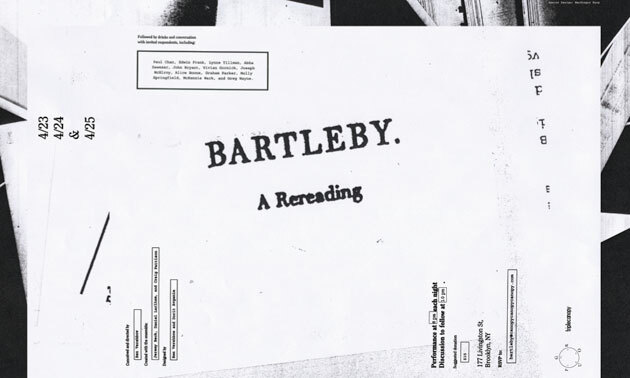 Before coming to 177 Livingston, Bartleby was premiered at IRT Theater, then performed at the East Side Institute for Group and Short Term Psychotherapy and Brooklyn Social Therapy. Bartleby was in part inspired by Vershbow's work at the Institute for the Future of the Book and the New York Public Library.